In this example we will create a simple Walled Garden for our website (www.gowifi.co.nz). A walled garden allows users that connect to your Hotspot to gain access to certain websites without authenticating through the Hotspot first. Add a new walled garden entry for access to www.gowifi.co.nz. Test the walled garden entry by connecting to your hotspot and either entering your walled garden address or clicking on the link to it on your login page as we have configured in the previous lesson when customising the login page. 1. Test you are not authenticated by trying to navigate to a random website like www.google.co.nz (This should fail and redirect you to the hotspot login page). 2. 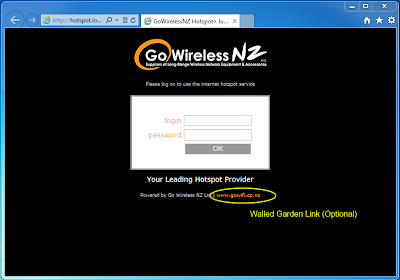 Test your Walled Garden by navigating to your address configured www.gowifi.co.nz (Note this should succeed).